So I ran across a tool recently in a PC Gamer article that was meant for people using an SSD for gaming. I currently have a 250 gig Crucial gen 5 SSD for my OS and a couple games. In my opinion an SSD makes a large difference in boot times for the OS and level loading for games. I am usually the first person in a Battlefield 3 game after a map load and can load a TF2 map super fast. Till now I was using the built in libraries that steam has to put a couple games on the SSD and the rest on a slower standard SATA drive. It was a real pain to move a game back to the SSD this way as you had to download it all over again and then certain games do not keep your key bindings, and I do not use the WASD keyset, which is a whole other post in and of itself (which may get written in the near future) making the usefulness of the loading speed of the SSD useless. 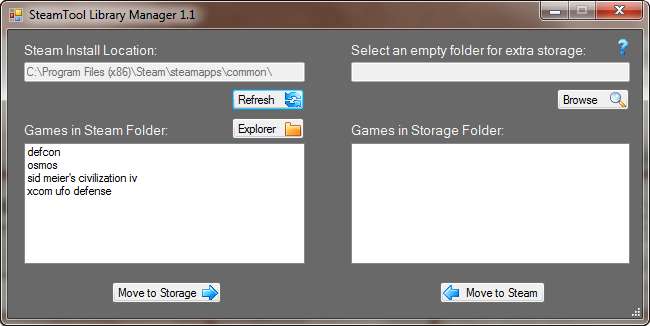 In the above article it referenced the SteamTool Library Manager 1.1. This tool is really sweet. It uses NTFS Junctions to create a folder on the SSD drive to point to a game folder on another drive. You need your drives you are using to be formatted NTFS. You can then move a game or two at a time to your SSD and enjoy the speed of loading etc that it offers. It moves the game back and forth fairly fast and so far most games I have tried work great. I highly suggest this if you have a smaller SSD you are running your OS on. So try this app out if you are in this same situation and let me know what you think. Note of warning: Since this is a data moving tool there is a possibility if used wrong that you may lose data.